"We finish well," Smith said. I think everything we want to be as a football team, we've seen signs of. But we need to be able to put that together." CHAMPAIGN, Ill. — Illinois faces its first real challenge of the season Saturday when it hosts South Florida at Soldier Field in Chicago. Not that the tune-ups were easy. 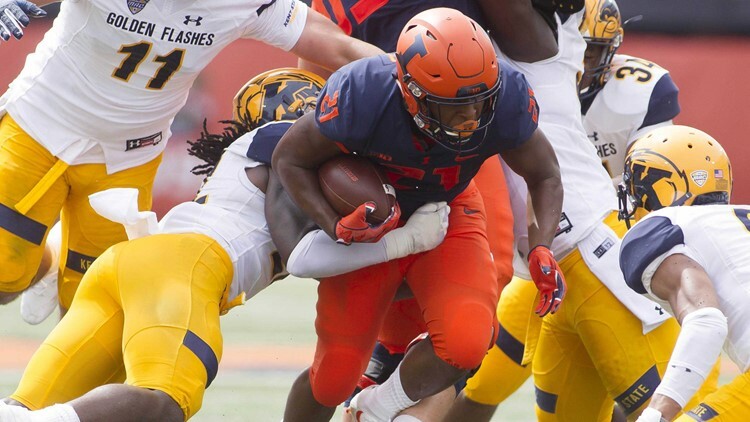 Lovie Smith's Illini stumbled in the first half of both games, despite pulling out home wins over Kent State (31-24) and Western Illinois (34-14). "We finish well," Smith said. "(But) we haven't played a full game yet. Hopefully this week we will peak at the right time. What we learned offensively is that we can move the ball. I think everything we want to be as a football team, we've seen signs of. But we need to be able to put that together." South Florida (2-0) is aiming for its fifth straight win against a Power Five conference team. The Bulls are 6-1 in their last seven games in such matchups, including a pair of bowl victories and last week's 49-38, come-from-behind win over Georgia Tech. The lone loss was to Florida State two years ago. Overall, the Bulls are 23-4 since the start of 2016and 10-1 in non-conference games. Still, coach Charlie Strong is taking nothing for granted. "We're on the road, so we're really going to have to play well," he said. "Any time you go on the road, you've got to pack your defense. This is one of those trap games, just because you can't let last week's performance get in the way of your preparation for this week." Illinois' defense has begun to gel, led by linebacker Jake Hansen, who made a team-record six tackles for loss against Kent State. While the secondary has been tested repeatedly in the first two games, sometimes with success, the young Illini will get their first look at a top offense on Saturday. South Florida amassed 680 yards total offense — second-most in program history, tops against a FBS opponent — in its only other meeting against Illinois, winning 47-23 last season in Tampa. The Bulls have 400-plus yards in 12 consecutive games. They've scored at least 30 points in 28 of 30 games dating to 2015. "We know what we are getting into," Smith said. "It's a big challenge for us in a lot of different ways." Complicating matters for Illinois is who starts at quarterback. Starter AJ Bush, a senior transfer, suffered a mild hamstring injury in last week's Western Illinois game and was replaced by freshman M.J. Rivers, who sparked the offense to a second-half comeback win. Smith isn't expected to make a decision on Bush's status until Saturday. If Bush can't go, Rivers will start and freshman Matt Robinson will back him up, team officials said. South Florida has no such problems. Quarterback Blake Barnett, a graduate transfer, has accounted for eight touchdowns in the first two games for the Bulls. He started Alabama's season opener two years ago, but transferred to Arizona State after being replaced at Alabama by Jalen Hurts. Barnett was backup there last season and graduated in May. Lovie Smith returns to Soldier Field for the first time since leaving the Chicago Bears, where he served as head coach from 2004-2012. He led the Bears to the Super Bowl after the 2006 season, the first African-American coach to do so. The Bears lost to the Indianapolis Colts 29-17. During his weekly press conference, Smith made it clear he wants to focus on the present, not the past. "Well, I've been to Chicago many times," he said to some laughter. "There is a lot of history at Soldier Field. Besides that, we are excited to face a team that we played last year." Strong understands how impressive it will be for his team to play on an NFL field. "We're going to have to play one of our best (games)," he said. "Playing in Soldier Field, both teams are going to be fired up, playing in a pro stadium. We're going to have to play really well (being) on the road."